This September you’ll find us strutting our stuff on the Courtyard Catwalk for the second year! 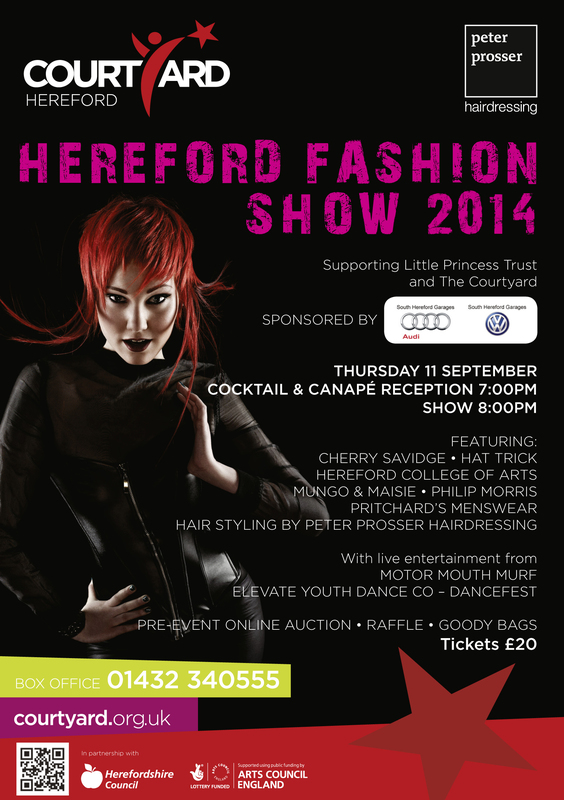 We’re proudly supporting The Courtyard and The Little Princess Trust in this year’s Hereford Fashion Show. You’ll see all of the latest unique fashion from local Herefordshire businesses, such as wonderful women’s wear from Cherry Savidge, sleek style from Pritchard’s, distinctive headwear from Hat Trick, charming childrenswear from Mungo & Maisie and of course the latest in chic country clothing from us, Philip Morris and Son. All topped off with show stopping do’s from the hair geniuses at Peter Prosser! We’ll be showcasing our new and exciting AW14 ranges from much loved country brands Barbour, Musto, Dubarry, Joules, Hunter and more. For just £20 you can join in all the fun too; start your evening off with a classy cocktail and canapé reception at 7pm, then take your seats ready for the show to start at 8pm. With live entertainment from Motor Mouth Murf and Elevate Youth Dance Company, it’s guaranteed to trump your usual Thursday night! Plus, if you’re feeling lucky, there will be a raffle on the night and we all get to leave with a glorious goody bag! Charity, Charity Event, Fashion Show, hereford, Little Princess Trust, The Courtyard. Bookmark.